This workshop is the second chapter of a study on the effectiveness of existing ASEAN-led mechanisms on maritime security cooperation. This second workshop was designed to map the shared maritime priorities and common interests among ASEAN member countries. Participants from eight ASEAN member countries presented insights on their respective countries’ concerns over the security and management of the maritime domain. While Brunei and Lao PDR were not represented at the workshop, efforts will be made to seek their inputs going forward. In general, workshop participants agreed that ASEAN member countries share some common maritime interests, however, not all are confident that their interests can be best advanced through a collective regional approach. The workshop showed that ASEAN countries share certain common security and economic interests, including security in the South China Sea, the importance of international law, especially UNCLOS, and the significance of economic development in the maritime domain. There is also a common recognition that the region is filled with untapped maritime resources. Optimal and sustainable management and extraction of these resources is crucial for ASEAN countries’ economic growth. The initiative to bring these shared maritime interests and concerns to a regional level, however, could potentially be impeded by individual ASEAN countries’ domestic concerns. Some ASEAN member countries are undergoing leadership change and associated recalibration of interests. These countries are re-adjusting their national maritime policies, laws, and strategies. As the sustainability of ASEAN mechanisms depends on national leadership, it is more difficult to cultivate a common awareness to address long-standing and emerging challenges amidst the existing unsettled domestic position within individual countries. The workshop highlighted several potential common denominators to strengthen maritime cooperation at the regional level. 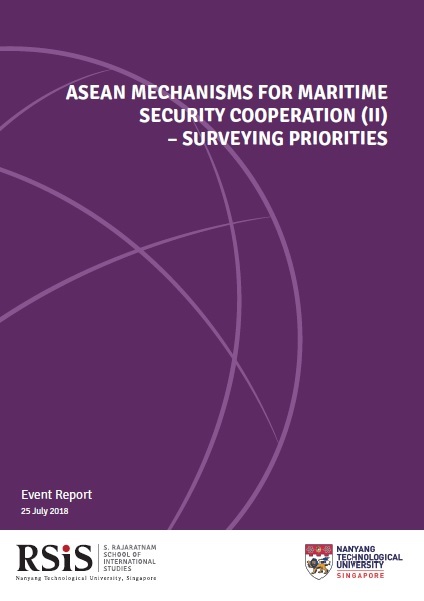 These include a shared concern among ASEAN countries on non-traditional security issues such as terrorism, piracy, sea robbery, the need for capacity building and information sharing, the responsibility to ensure safety of navigation at sea, as well as the responsible management of maritime resources and the environment.